Early European visitors to the Democratic Peoples Republic of Korea remarked that the country resembled "a sea in a heavy gale" because of the many successive mountain ranges that crisscross the peninsula. Some 80% of North Korea is composed of mountains and uplands, separated by deep and narrow valleys. North Korea's population of roughly 24 million is one of the most ethnically and linguistically homogeneous in the world. 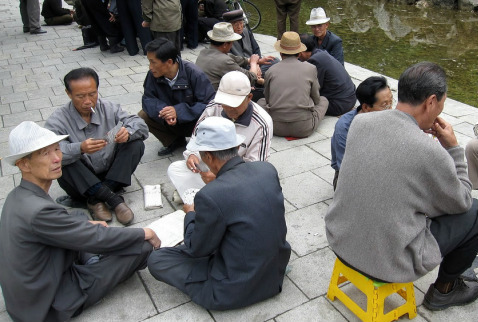 According to North Korean documents and refugee testimonies, all North Koreans are sorted into groups according to their "Songbun", an ascribed status system. North Korea is the world's most militarized society, with a total of 9,495,000 active, reserve, and paramilitary personnel. Personnel for the new open door into N. Korea. Pray for Kim Jong-un, who forcibly indoctrinates people into the bizarre policies of the “Dear Leader”. The “Hermit Kingdom” is repressive, where the populace are kept ignorant of the outside world. Imprisoned Believers. People suspected of not being loyal to the regime because they are Christians are deported to prison camps without trial—often with their whole family and mostly without any chance of being released.